These days, I’ve been reading a lot about the importance of gut health and how fermented foods can promote it. Because I can only eat so much sauerkraut, I starting drinking Kombucha (fermented tea) for its health benefits. I’ve read that Kombucha is high in probiotics and antioxidants and provides the same benefits as green tea. Instead of making it myself, I buy it because improperly made Kombucha can be dangerous to consume. In fact, most websites encourage purchasing this product commercially made and storing it properly. 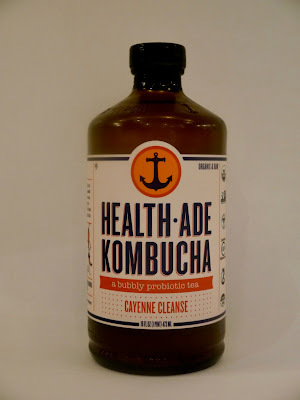 Right now, my favorite is Health-Ade’s Cayenne Cleanse. Spicier and a little less vinegary that others I’ve tried, this drink is downright tasty. Plus, it makes me feel good to consume things that taste good and are good for me!